It is fairly easy to contract Lyme disease – most anywhere. Those who play field sports such as field hockey, golf, lacrosse, soccer … the teams, coaches, parents and fans usually sit on the sidelines watching the game. Many times the sidelines abut wooded areas. This is where the ticks are. On the sidelines. Although this student did not contract this illness in this way it would behoove schools to pay attention to sports and ticks to avoid a similar law suit. Connecticut student who contracted tick-borne illness on school trip awarded $41.7 million | masslive.com. 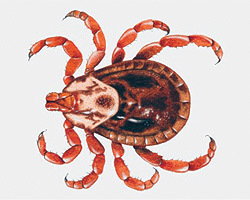 This entry was posted in Lyme Disease and tagged Cara Munn, co-infection, Connecticut, Hotchkiss, infectious disease, Lakeville, Lyme, masslive.com, school, Student, tick. Bookmark the permalink.